Although it’s also known as “German Pancake”, the “Dutch Baby” is an American invention based on a German pastry. The name “Dutch Baby” was coined by Manca’s Café in Seattle in the early 1900s. Dutch Babies are similar to Yorkshire puddings or popovers and can be savory or sweet. Unlike pancakes, they are always baked in the oven and contain no chemical leavening such as baking powder. This fun and delicious treat is typically eaten for breakfast or brunch in America. 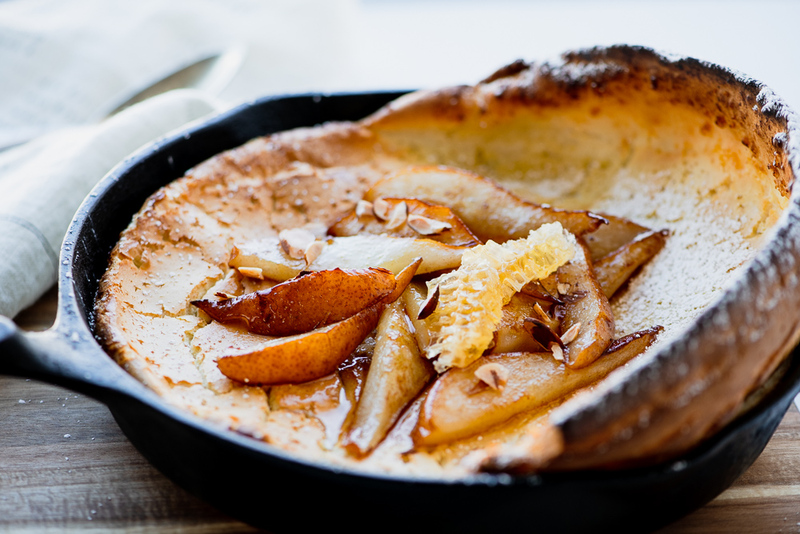 Our Bosc Pear Dutch Baby is a wonderful dish to serve at a weekend family breakfast. The sweetness of the pear works particularly well with the Dutch Baby and will come through even more if you add the optional garnishes. Melt 2 tablespoons of the butter and pour into the bowl of a blender. Add the eggs, milk, vanilla, flour, sugar and salt. Blend until smooth and fluffy, about a minute. In a 10-inch cast iron skillet melt another 2 tablespoons of butter over medium-high heat until frothy. Pour the batter in the skillet and immediately place in the oven. Bake for 18-20 minutes or until puffed and golden brown. While the Dutch Baby is baking, heat the remaining 2 tablespoons of butter in a non-stick skillet over medium-low heat until frothy. Add the sliced Bosc pear and cook until the pears start browning. Add the cinnamon and honey or maple syrup, stir to coat and continue cooking until the pears are golden and caramelized, about 10-12 minutes. Remove the Dutch Baby from the oven and transfer to a large plate. Top with sautéed pears and optional garnishes if using (drizzle with honey or maple syrup, dust with powdered sugar and/or sprinkle with toasted nuts) and serve warm.